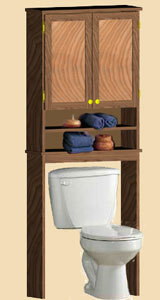 This tall version of the Cape Cod wall vanity is designed to fit over the commode. It can be moved more easily because it does not have to be fixed to the wall. Made from solid hardwood and veneer, it has two flat panel doors hide an adjustable shelf. The opened shelf storage area underneath is perfect for holding soaps, air fresheners, a tissue box or bathroom decorations. The construction incorporates solid hardwood and veneer and it is fairly easy to build for the beginner, using simple tools and joinery techniques.